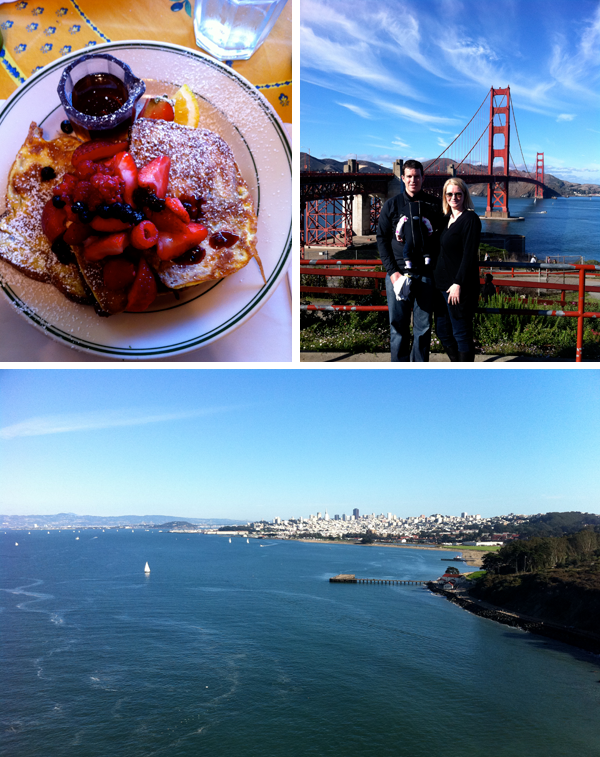 We had a lovely week in San Francisco, it is such a great city that has some similarities to Seattle (near where I grew up) that I really enjoy. We were there because my husband had a work conference which they also invited the spouses to attend. A little over a month ago my husband switched jobs and careers (right when we had the baby) and the exciting news is that we will be moving (probably twice) in the upcoming months to California -- they haven't let us know where yet, but I will keep you posted ... we are thrilled. This time we hit some fantastic spots thanks to your great suggestions + other friend's reminders, thank you! Tartine Bakery : I've long admired their self-titled book Tartine and was pretty excited to finally make it here, twice. 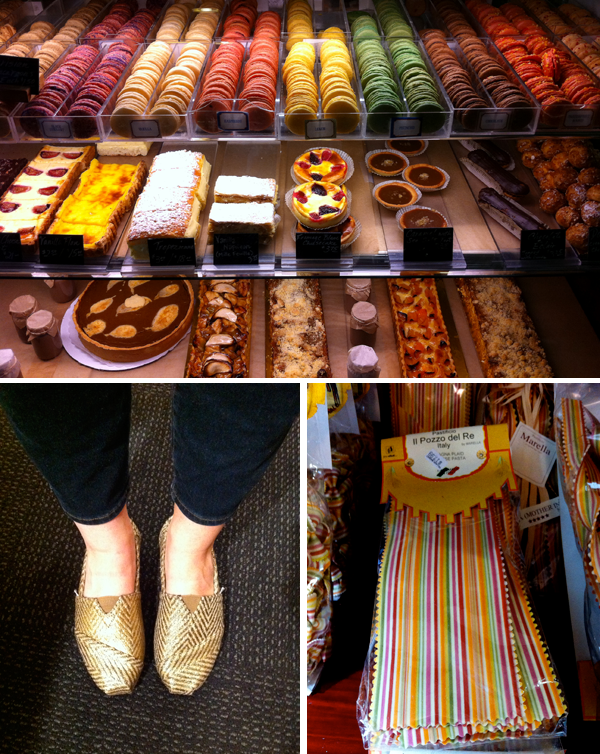 It is where I picked up that yummy croissant above among other goodies. Bi-Rite Market + Creamery : The market is a foodie's paradise, and the ice cream at the creamery is incredible, I tried the delicious salted caramel. Pizzeria Delfina : Yummy pizza. Out the Door : Thanks to Jordan I have found a new love for Vietnamese food -- this place rocks. I also picked up some take-out (for a night in, when the baby was fussy) at their other locations. The Ferry Building : I don't know if a trip to San Francisco would quite be complete with out a trip or several trips to the remarkable Ferry Building -- I love this place. Paxton's Gate: One of the most unique and interesting stores full of nature items. Paxton's Gate Curiosities for Kids : Awesome Kid's Store. The Curiosity Shoppe: well curated selection of design, art & craft objects and more. Below I compiled a google map of places I enjoy and spots I hope to hit in the future, you can check it out here. Of course I would love to hear more of your tips to add to the list -- what is missing? Good luck with the move! And congratulations. OMG! Sooo beautiful shoes, is it Toms? Love your Toms and SF. It's such a gorgeous place. I love Delfina!! Looks like a beautiful trip! Very cool news! So exciting. Love your photos, and looking forward to more when you make the move. looks like you had a great trip + congrats on the pending move - exciting!! so exciting to hear you are moving to ca.! sending good thoughts your way for a smooth move. Thank you! I'm going there for 6 days in a few months, and I'll be able to visit all of your recommendations! I love San Francisco, but I haven't been back in ages. Good luck on your move! Are you going to San Francisco? Oh my- I love that you put all of your visits into that handy google map! I've been here almost half a year now, and some of the spots during your visit are still high on my to-do list. Bi-Rite being #1.
you've probably been to more places in s.f. than i have and i've been living in the bay area for 12 years. thanks for posting the google map. i love your blog and can't wait to see how cali will influence it. thats so exciting you will move to CA..I adore it here and it looks like you hit all the good spots! LOVE your toms..just posted about them yesterday and they look good on..glad to see that! I just visited last weekend and we hit several of the same spots! 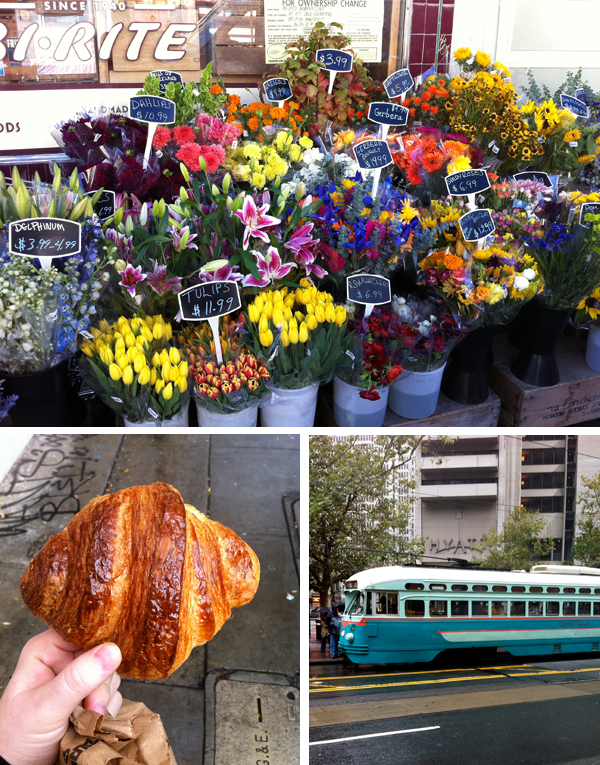 I just loved the city- I definitely would have appreciated your googlemap last week though! I moved to SF after college and never left! Love so many things about the area. On your next visit I'd recommend a walk along Crissy Field in the Presidio with killer views of the bay and the Golden Gate bridge. Finish off with a visit to the The Warming Hut Café and visitor center. Awesome hot chocolate. Also Nest on Fillmore and Flora Grubb. what a super fun post! thanks for sharing your trip! those toms are now on my christmas wish list!! !